I was reading the KH2 manga and have realized something. There is a huge change in the Hollow Bastian scene between the game and the manga. Something that changes the perspective of Donald and Goofy’s character development in relations to the King. Notice how he doesn’t want to go because he wants to help Leon and the others. That is important for later. Anyway, after this you know the rest. Mickey overrides Sora by commanding Donald and Goofy to take Sora to find Riku and Kairi. Keep in mind that by this point in the games Donald and Goofy had always shown severe dedication to King Mickey and his orders. They never had questioned him when they were stationed to find the boy with the key and stick with him in the original KH game. They even took his orders so seriously that when it came to light that Riku was the original keyblade master, they dropped Sora like an old hat. With little regret mind you. 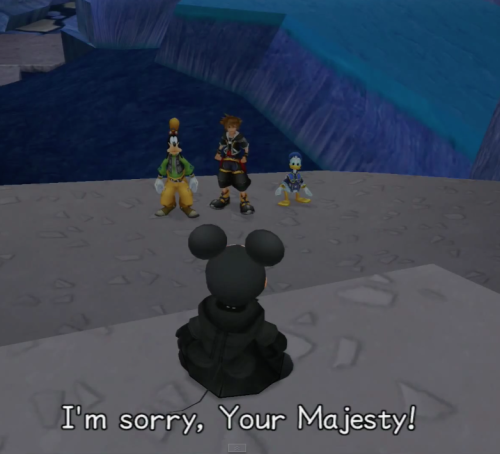 Sure, they said sorry and came back to Sora later, but when the choice was first made, they stuck with the King’s words. Why is that important here? Well, they had a good reason to stick with Sora when it was important. Riku may be the original keyblade master, but he was on the wrong side. So they followed what they figured was right and even though they inadvertently disobeyed Mickey’s orders, it was the right choice given the circumstances. So why does that matter? Because when we see Donald and Goofy deciding to go headfirst into the Hollow Bastian battle in KH2, we also see them directly disobey orders. For no real reason other than to make Sora happy despite how dangerous it is. Think about that for a second. These two have abandoned Sora before because they kept true to their mission (which was to find the King himself in the first game). Now they have flat out disobeyed their King’s orders for Sora’s sake! Imagine this from King Mickey’s perspective.The last time he met with Donald and Goofy was when he was on the other side of the Door to Darkness, and a few very brief moments before this day. He hasn’t even spent quality time with Donald and Goofy, his closest friends, for at least a year and a half. That is a long time. And time has a way of changing people. When Mickey ruled Disney Castle, he knew Donald and Goofy as incredibly loyal servants and friends. People he trusted the most. So naturally he would assume they would follow his command, no questions asked. Like how things used to be. And keep in mind that Mickey is thinking on the bigger picture here. If Sora stays to fight, and gets injured, or even killed, who can save Kairi? Who can find Riku? They still have no idea where the Organization’s stronghold is at the point in the game. And without the chosen wielder of the keyblade, there wouldn’t be any chance to stop the Organization’s plans. Mickey doesn’t know where Riku is. Donald and Goofy don’t know where Kairi is. If Sora were to die at Hollow Bastian, there would have been no hope to save the worlds. So Mickey honestly had the best plan. They’ll keep at fighting the heartless, while Sora, Donald, and Goofy continue their search for Riku and Kairi. Mickey honestly thought that his two best friends would follow his order, because he actually knows what he’s talking about! But they didn’t. In one swift motion, Mickey’s status as king, planner, and friend is thrown aside in Sora’s favor. Donald and Goofy’s loyalties have changed. After being away for so long, this is the first time Mickey is face to face with the idea that suddenly… he really doesn’t know his friends anymore. And now he’s at the crossroads between what used to be a close friendship and what has become of them. They have become so close to Sora that they flat out refused to listen to Mickey, a friend whom they have known for far longer than they ever knew him. Mickey has suddenly lost that connection with his friends, and thanks to how close they are with Sora now, he might never fully recover that connection. This is why I think Mickey is so suddenly okay with fighting alongside them after this moment in the game. Before, he stayed in the shadows mostly alone during KH2. We still don’t know his reasoning, but I think he avoided the others because he didn’t want to see them get hurt. Or them see him get hurt. Remember he is still scarred by the “deaths” of Terra, Ven, and Aqua. So the idea that his friends could get killed still haunts him, making him afraid to be with others in battle. But Mickey is also standing at the crossroads between keeping away for his own inner protection, and drifting away from his closest companions. 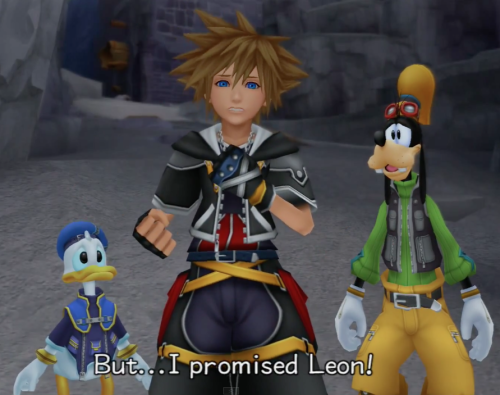 I believe that he wanted to stick with Sora, Donald, and Goofy after this moment because secretly he misses being as close to his friends like Sora is. Sora essentially replaced him. And this is his desperate moment to reunite with the friends who changed right under his nose. And you know what? The manga decided to change things for the better. 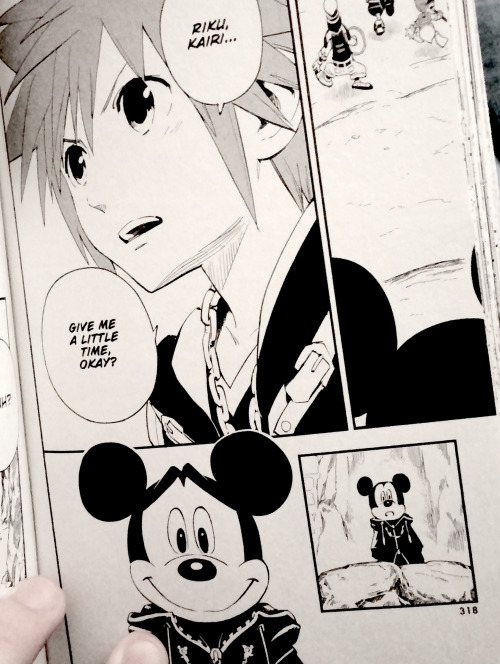 During the exact scene in the third KH2 manga, instead of having Leon being the reason Sora wants to fight in the Hollow Bastian battle, do you know what it has been changed to? That’s right. 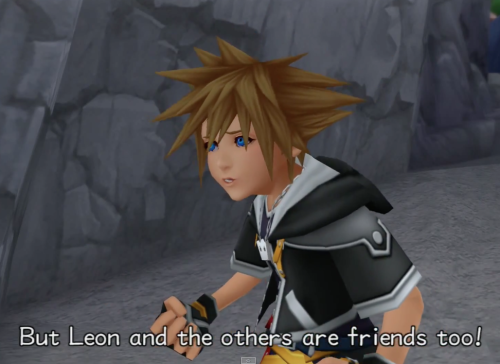 Sora’s first response isn’t saying how the others are his friends too. It’s that MICKEY need their help. In the game, they never even consider him and run off on their own, leaving Mickey in the dust. 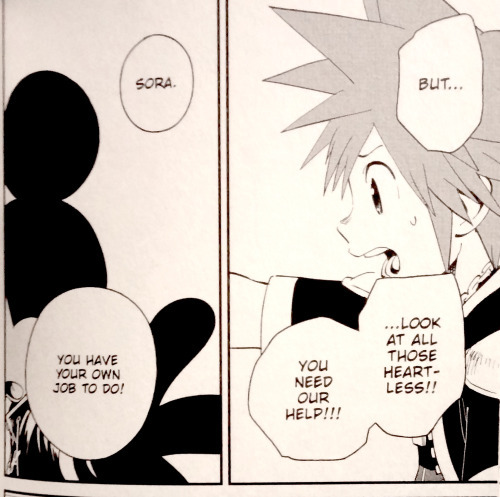 But in the manga, Sora acknowledges Mickey not as an obstacle, but as a friend who needs his companions’ aid. It’s only after Mickey responds that he can take care of it that Sora even acknowledges Leon and the others. 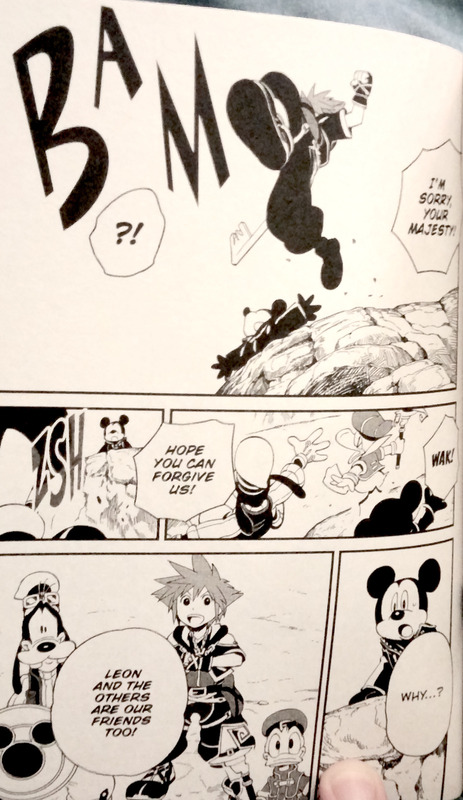 In these few pages alone, the manga respects Mickey’s role as Donald, Goofy, and Sora’s friend by having them defy an order for Mickey’s sake. In the manga, they see that Mickey needed help. That he was alone. And he needed his friends now more than ever. There isn’t a scene with Mickey being angry for defying orders either. After he realizes that they are willing to stay to help him in his need, Mickey immediately smiles and agrees to go with them to battle. He is no longer afraid to be with his friends in this war. 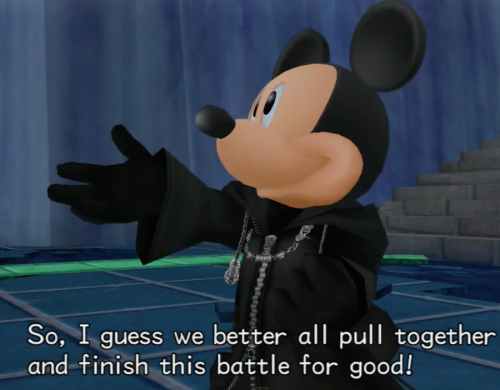 Yes, Leon and the others needed Sora too, but because they show that they still care about Mickey to stick with him during the rough times, this scene alone changes the entire dynamic of the four. In the games, it seems like Mickey had been replaced by Sora. But in the manga, he is still considered a friend to all three of them regardless of how many years it has been. 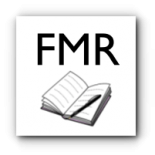 This entry was posted on August 10, 2015 by lorimori and tagged adaptation, game meta, kingdom of hearts, manga, mickey mouse.